Two Striking Photos From Today's APEC Meetings : The Two-Way The forum's first day has already brought us interesting images. In one, the leaders of China and Japan reflect their countries' unease; in another, world leaders dress alike. Japanese Prime Minister Shinzo Abe (left) and Chinese President Xi Jinping shake hands at the Great Hall of the People in Beijing on Monday, prior to their first-ever talks. This week's meeting of the Asia-Pacific Economic Cooperation forum started Monday, but the sessions have already brought us two interesting photos. In one, the leaders of China and Japan reflect their countries' unease; in another, world leaders dress alike. In an attempt to ease tensions between China and Japan that center on contested islands and a complicated history, Japanese Prime Minister Shinzo Abe and Chinese President Xi Jinping met for the first time today. It was the first time a Chinese and a Japanese leader had met in person in more than 2 1/2 years. "Abe said China's peaceful development is a good opportunity for the international community and Japan. "He called on the globe's second- and third-largest economies to work together and fulfill their responsibilities for peace and prosperity in the region and the rest of the world." 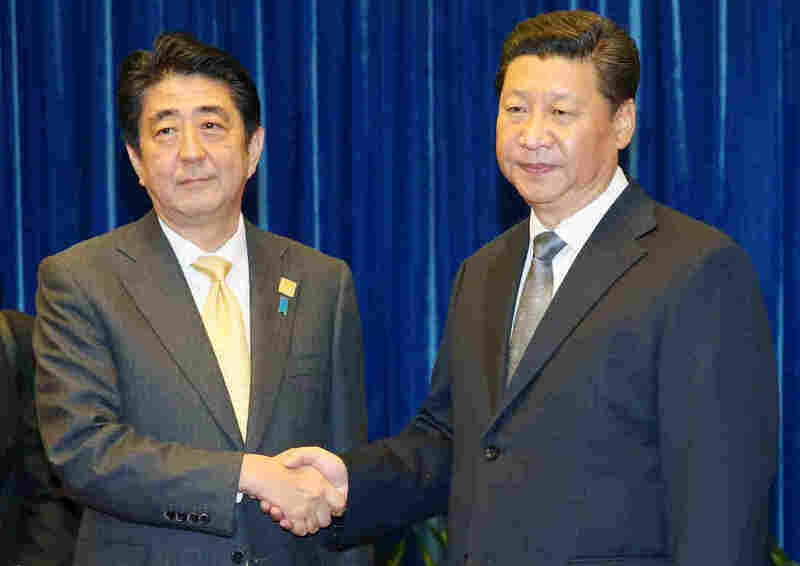 "China hopes that Japan continues to follow the path of peaceful development and adopt prudent military and security policies, Xi told Abe. "To build stable and healthy bilateral relations, Xi said, China and Japan must conform to the progressive trend of the times." And finally, there's the welcoming ceremony. For the APEC forum's traditional photo op, leaders all wear an outfit designed by the host country. 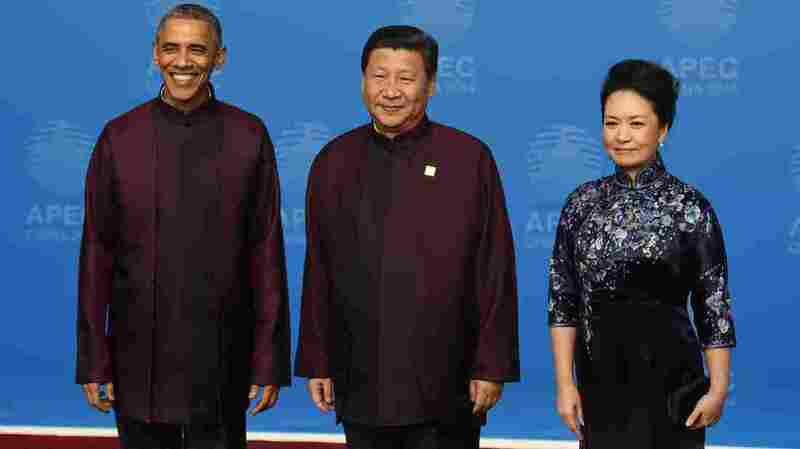 The clothes for this year's class photo led one journalist who filed a pool report to say President Obama and China's President Xi Jinping were wearing "dark purple silk shirts that looked a little Star Trek-y to me." President Obama poses with Chinese President Xi Jinping and his wife, Peng Liyuan, as they arrive for the APEC banquet Monday. It's traditional for leaders attending the summit to dress alike for a photo op.